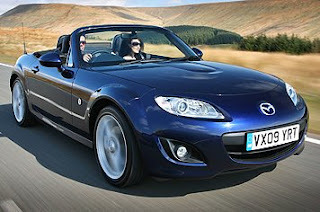 The new Mazda MX-5 has gone on sale with prices starting from £16,340. An entry level 1.8 SE coupe roadster comes at a £2,000 premium over a same spec soft-top version, while the top-of-the-range car is the 2.0i PowerShift roadster coupe at £21,690. Fuel economy in the 1.8i SE is 40.4mpg, up from 38.7mpg in the previous generation MX-5, while CO2 emissions are increased by 7%, to 167g/km CO2. 4 different powertrains are available in both versions; the 1.8i and 2.0i, which both have 5 speed manual gearboxes, the 6 speed manual 2.0i and the 2.0i PowerShift 6 speed automatic which features sequential paddle-shifts. Standard equipment on all models includes a leather steering wheel, alloy wheels and an auxiliary connection port for full iPod connectivity. A limited slip differential features as standard on all manual 2.0 SE cars, as does traction control and dynamic stability control. The roadster coupe also features the world’s fastest retractable folding hard-top roof which can go up or down in 12 seconds.